Coffee beans used are a blend of Costa Rican and Sumatran from Berres Brothers Coffee Roasters in Watertown, Wi. Tyranena- The Devil Made Me Do It. A- Deep dark brownish black with a small tan head. Sticky light lacing. S- Heavy fudge and chocolate with heavy roasted black coffee and chocolate malt. T- Thick sugary fudge and dark chocolate with a good heaping dose of black coffee/ espresso. Heavy sugary caramel malt with bitter chocolate. Light touch of alc. M- Very thick and sweet. Heavy sweet malt dominates with a slight bitter coffee bean touch. Creamy body with a super sugary sweet finish. Slight touch of alc. Overall- Amazing tasting porter thats just a tad too sweet. Very good regardless. 12oz bottle courtesy of DaPeculiarDane during the 2nd CTA pub crawl. Pours into my glass a deep black that hardly lets any light through except for a bit of dark brown on the edges. A half inch of light tan head tops it off. Aromas rush at me with smoky, roasted coffee well in the forefront. Chocolate is present as well as some rich dark malts. First sip brings a super smooth rush of roasted dark malts enveloped in coffee beans. Somewhat smoky with a wonderful slightly oily slickness from the oatmeal. Chocolate and light vanilla notes mix in on the way down. It finishes off slightly dry with a lingering brewed black coffee flavor. Quite a tasty brew. Mouthfeel is medium bodied and smooth with a good steady carbonation. Rolls across the palate with ease. This is a tasty coffee porter for sure, the oatmeal adds a nice slickness. I wish I had more than this one bottle. 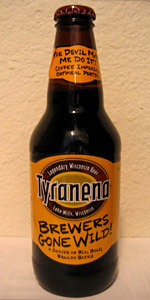 Another tasty brew in the Brewers Gone Wild series from Tyranena. Just another reason to visit Wisconsin!! Wow! Perfect beer, it took me back to a Sunday morning whit freshly brewed coffee. Pours a dark pitch black color with a thick foamy beige head. Good retention and nice lacing. Dark roasted coffee aroma with hints of chocolate maltiness, oatmeal and toffee. Roasted oatmeal chocolate maltiness with a nice roasted coffee flavor. Hints of toffee, nut and very subtle hops with a dry finish. Very smooth because the roasted coffee flavor is not overwhelming. Extremely quaffable and delicious. Tasted 18 November 2012, reviewed from notes. Pours black in the glass. It might have some color, but I can't see it. Half-finger of medium tan head, okay retention, little lacing. Okie dokie, but not great. Where's the head? Smell initially reminds me of FBS, though it doesn't take long before that impression fades. The coffee is sharper, the oatmeal less rich. The coffee is really dominant, and it's not bad, but it's definitely very dark roast, which makes me worried about the flavors it'll bring. Yeah, taste is pretty much what I was expecting; the main surprise is that it's a lot lighter-flavored than I thought it would be. The malts feel more like those of a black ale than a porter or stout. And I'm getting only the faintest hint of the oatmeal. Mostly I get watery slightly-over-roasted coffee. A whole lot of dark bitter, from the coffee and malts, and I have to guess the hops. Low on rich and sweet, and I really want more of those. Mouthfeel is a problem. It's watery, undercarbonated, and just very little like a porter. What went wrong here? This has oatmeal in it? Where's the body? I'm displeased. This beer is okay, but it's so much less than it could be. The mouthfeel is thin, the flavor is dominated by not-so-good coffee, and there's not a whole lot redeeming about it. That initial comparison to FBS is looking way off base. Chilled bottle into a glass. I believe I received this in a trade from Buebie. Thanks Brian. A: Pours a nearly opaque mahogany that darkens to pitch black in the center of the glass. It is a translucent ruby-chestnut color at the edges. The pour produces a half-inch of cream-colored head; it collapses over a minute into a moderate collar on the brew. Nice swigs of lace when I sip, but nothing that sticks. S: Coffee, lots and lots of coffee. Dark chocolate. I can't smell anything else, but that's just fine. Even for a guy who doesn't enjoy coffee beers, there's something alluring, earth, and organic about the smell that works pretty well. T: Coffee on the taste, as expected. I was pleasantly surprised; I expected this to be acrid and bitter, but chocolate is present in just the right quantities to offset that characteristic. The roasted flavor is also offset by a touch of caramel malt. M: Full-bodied, low carbonation. Extremely smooth, and it flows like velvet throughout the taste. Wonderful mouthfeel that delivers the flavor impeccably. D: Coffee beers don't excite me, in general; but I enjoyed this one enough that it's both making me reconsider my opinion and desire more. Appearance: light black bodied beer with 1 finger of light mocha head. Drops quickly to no head at all. Smell: This smells like super concentrated expresso. Just like a gourmet coffee bean is being roasted in your beer glass! Yeah the nose is a bit one demensional, but its working for me! Mouthfeel: medium bodied beer with low end of moderate carbonation. This beer is really drinkable despite the huge roasty coffee flavor in this beer. Nice silky feel to it. Not a hint of alcohol in this beer at all. Overall: Honestly, I like this better than Founders Breakfast Stout because the coffee notes are just out of control and it so drinkable. Tyranena you guys are awesome; keep on rolling with the BGW series! Everytime you guys have a fresh BGW beer released...I always gotta get a few 4 packs! 12oz bottle, bottled 25 Oct 2013 that I picked up today at Riley's to try before the recently released Devil over a Barrel (the partially BA version of this beer). Poured into an unlabeled snifter today, 4/17/2014. A- Opaque dark cola brown body. Doesn't illuminate at all. Comes with a one finger off-white head. Good retention, halfway sticky lacing. S- Lots of rich black coffee, baker's chocolate, roast malt. Milk chocolate sweetness, almost like a lactose addition. Smells better than I expected. F- Black drip coffee, milk chocolate, roast malts and a rich nuttiness that complements the coffee well. A lactose-like sweetness balances the coffee bitterness on the backend. M- Medium bodied, on the thinner side as it is slightly watery in feel, but not in flavour. Good carbonation, expected for the style. Finish is nicely balanced- not too dry nor is it watery, but it is also simultaneously sweet (milk chocolate sweetness) and bitter (black coffee). Would have liked the body to be more substantial, especially as this has adjunct oatmeal. O- Very good imperial porter with a very rich malt profile that blends coffee in very well. A very good buy at $10/4-pack. Looking forward to trying the partially BA version of this. Coffee, coffee, and then a bit more coffee. Too much of a good thing? Almost, but not quite. Semi-sweet chocolate bats cleanup. Oatmeal lends a bit of chewyness to the malt. Some astringency moves in toward the finish with a somewhat dry note at the end. A bold beer, no question. I'm not a big coffee/java beer guy but this is quite impressive. It has a massive aroma or coffee grounds but also has a roasted maltiness to the smell as well. Taste begins heavy with the coffee, but what is impressive is the way it softly blends in with a flavorfull roasted malt/milk chocolate flavor..
Black beer. Thin creamy brown head. Lace is adequate. This beer smells awesome. Exactly the way it should. Black coffee. Spent coffee grounds. Milk chocolate. Roasted malts. A little caramel. It all comes together perfectly. First sip gives me everything the nose offered. First off, there's the coffee. Smacks you right in the face. But a nice sweetness follows that bitterness to give this beer a nice contrast of tastes. The roastiness is perfect. And the bitterness that lingers comes from the coffee and roasted malts. Goes back and forth from bitter coffee/roasted notes to sweet caramel back to coffee... Mouthfeel is luxuriously creamy and smooth. Medium to medium-full body. This is one of the best "coffee" brews I've had. Thanks to natasharai for giving me an opportunity to try this huge beer! A: Almost a finger of tan head with a very aggressive pour. Pitch black with light brown only visible in the light. Some retention but no lacing. S: Coffee beans, bitter chocolate, oatmeal, and toasty notes. T/M: Huge espresso flavors--like drinking a Starbucks doubleshot. Super viscous mouthfeel and low carbonation. Silky smooth to boot. More coffee. A burnt characteristic really comes out as the beer warms. Did I mention coffee? D: A great sipper, but also incredibly drinkable for such a huge mouthfeel and flavor. Very tasty! This is basically as close to black as burnt magenta-orange can get. The head is a fleeting tan, and resides afterwards as a collar. Once you get past the dark roasted coffee bean nose- and, honestly, you never will-- there's a thick fudge brownie maltiness underneath. I'm a coffee drinker, and I love it, but part of me still thinks that the forward aromas are so acridly roasted as to suggest burnt aspirin. Espresso beans rush into the mouth. No cream. No sugar. No fancy-pants syrups. Just black, hard, Italian roast. The oatmeal adds a spacey flakiness, and is quickly gobbled up by the aggressive burnt coffee flavors. Malt is mighty, thick and gooey and appropriate over-sweet to attempt balance with it brownies and Tootsie Rolls and caramel glazings. Ultimately, coffee wins out. That is unquestionably what this is all about. Approaching full bodied as it plods thick roasted carnage across the mouth. It presents as nearly uncarbonated. But still, somehow, stays quite drinkable. I drink coffee all day long, but still this is more of a "mood" beer for me. It's intense almost to a fault, but it is well structured as it seems to mimic much of the malt load from their previous (and delicious) Imperial Porter, Who's Your Daddy. And as such, it might be worth tossing this into the Ol' Grandad Barrels to see what happens. Sample at the Most Honorable SuperHappyFun Stout Tasting. Thanks to MIBRomeo for the trade! This brew is a dark brown color with touches of ruby around the edges. Medium and rocky light brown head that diminishes steadily, and stringy lacing. Lots of coffee in the nose along with some roasted malt and chocolate. Medium-bodied with a nice roasty character and flavors of coffee and malt backed up by some hops and chocolate. The finish is dry and roasty with a lingering coffee aftertaste. Overall this is an enjoyable Porter that I hope to try again some day. I love this style. I love dark beers with coffee. So naturally, this was a winner. The appearance is a dark brown with cocoa head. Not a very big head, one finger or so. It has no lacing. The color is a very murky brown, and it is fairly thick. The smell is very good, it had dark sweet prunes and peaches. There is a bitter espresso smell as well. The taste is of burnt coffee, roasted grains, a little bit of hops as well. There is a slight citrus hop characteristic that throws me off guard. It is espresso bitter, but knowing that this uses coffee beans it comes across a little burnt. There are hints of chocolate that make this a well rounded oatmeal porter. Delicious. THe mouthfeel is a bit thin, contrary to my belief that it was a thicker brew from the pour. Drinkability is good as well. All around enjoyable.